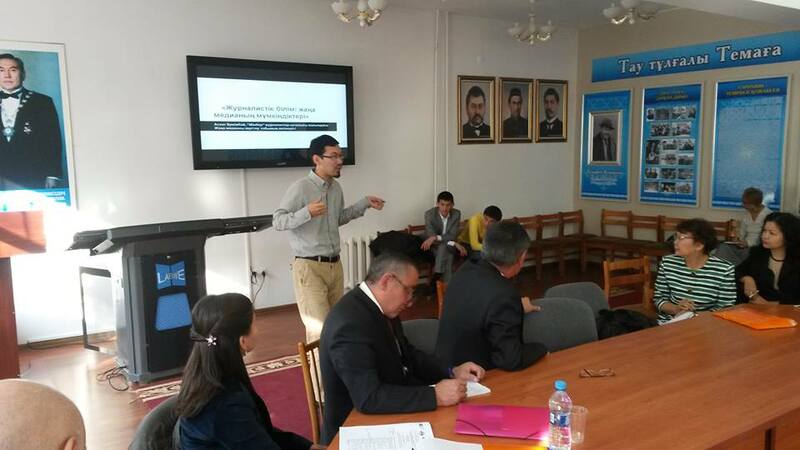 From October 31 to November 2, 2013, UNESCO Cluster Office Almaty, Delegation of the OSCE Centre in Astana, Al- Farabi Kazakh National University and “Minber” Public Fund organize a round table and two training sessions to modernize Kazakh- journalism education and capacity building of media professionals. This event is part of a broader process conducted by UNESCO, OSCE and partners since 2010 on the basis of academic institutions with the participation of representatives of the media industry. New specialized syllabi on journalism education proposed by UNESCO, particurlarly on data mining, significantly impacted journalism education in Central Asian countries. Activities will contribute to increasing the number of institutions practically applying UNESCO model curricula for journalism education and to the increasing the number of educational resources in their native language. The model curricula focuses on training in the field of investigative journalism with the educational components of sustainable development, improving access to information and citizen participation in good governance. The round table and two training sessions will be attended by 75 representatives of 15 universities from 11 regions, professionals in print media, television, online journalism and members of non-governmental media organizations. According to Karlyga Myssayeva, vice dean of Journalism faculty for scientific Innovation service and International affairs KazNU - New specialized syllabi on journalism education proposed by UNESCO, particurlarly on data mining, significantly impacted journalism education in Central Asian countries.